Beautiful color, washes up nicely, highly satisfied with Ms Simpson's bath rug. Would purchase again! 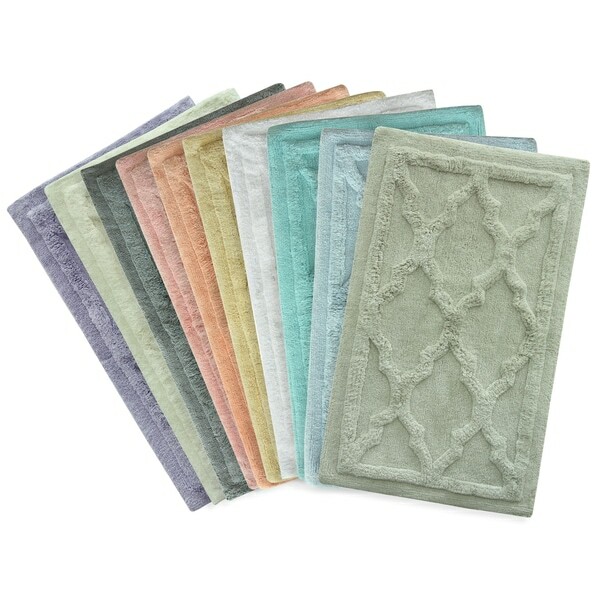 Finish off the look of your bathroom decor with the Jessica Simpson Penelope bath rug. With ten different color options in a classic trellis pattern, this rug is sure to match existing decor pieces. With a soft and absorbent tufted cotton construction, stepping out of the shower is a delightfully comfortable experience. I bought several of these rugs... in white after my previous fluffy white rugs ended up getting all mushed and worn out after only a year. Not only are these pretty durable, considering that they are white, but they look like I spent way more that I did. Definitely recommend these rugs. I received this rug last week. I ordered it in lavender and it is beautiful. It is thick, cozy and very well made. Would recommend for anyone looking for this size of bathroom rug. Very nice. Thank you. I ordered the gold one. It is a thick, beautifully subdued yellow fabric. Haven't used it yet because the house isn't finished, but it will be beautiful in our bathroom. Just what I wanted for new house decor. The color of the rug in the photo represented in the ad as a light green for Rainy Day. The color of the rugs received doesn’t even show a hint of green in those rugs! I received my order and very pleased with rug. The color is perfect and great quality. I would buy again and highly recommend. I first purchased a smaller one of these rugs, and later purchased two larger ones. I selected the blue, which is a light turquoise or aqua color. They are thick and very well made, and wash up well. I am very pleased with this purchase. Very lovely, quality rugs. Beautiful color (shrimp). I ordered this for my guest bath. The quality is first class. Good quality material has a nice look! This is a nice thick rug. My only issue is that it sheds. This product is super thick and plush...great mat for the bathroom. Love the color. Good quality. "Is rainy day a grey green?" "I don't understand the color options in the dropdown list. Which one corresponds to Yellow?? Shrimp? Gelato? Terrible names for an online item." Hello Deborah G., each color has a corresponding labeled photo. You would choose Apricot Gelato for the yellow option. Thanks for shopping with us! I needed a gray, but I wanted an all cotton rug with some visual interest and no latex backing. I also needed the same rug in 2 different sizes, and this rug was one of the very few that met those requirements. "Do these rugs have a rubberized non-slip bottom?" Hello missinginfo, this does not have a rubberized non slip bottom. Thanks for shopping with us!